Mahinda Rajapaksa, one of Sri Lanka’s two dueling prime ministers. Paula Bronstein/Getty Images. Two prime ministers are claiming power in Sri Lanka in a bizarre political struggle that has flung the country’s democracy into crisis. Violence erupted Friday in Sri Lanka’s Parliament after supporters of one prime minister reportedly flung chairs, books, and chili paste at the opposition. It was the latest twist in a saga that began abruptly on October 26 when Sri Lankan President Maithripala Sirisena ousted Prime Minister Ranil Wickremesinghe and installed a replacement. Mahinda Rajapaksa, the person who was installed, is a former president who presided over the end of Sri Lanka’s bloody 25-year civil war and is accused of serious human rights abuses during his rule from 2005 to 2015. Sirisena says that he pulled off this dramatic prime minister switch because his life depended on it — literally. In a speech in October, days after his political maneuver, Sirisena said that one of Wickremesinghe’s cabinet ministers had been plotting to assassinate him. So Sirisena argued he had no choice but to kick Wickremesinghe out and put someone else in his place. What makes this situation even stranger is the on-again, off-again alliance between Sirisena and Rajapaksa, the replacement prime minister. Sirisena had been a member of Rajapaksa’s cabinet back when he was president, but broke with him ahead of the 2015 elections. Now Sirisena has forged a political partnership with Rajapaksa once again. Rajapaksa — who was sworn in during a hasty ceremony on October 26 — claims he has popular support, including a majority in Parliament, which justifies his takeover. But Rajapaksa’s elevation is looking more and more like a true power grab. First, PresidentSirisena suspended Parliament, which critics saw as an attempt to strong-arm votes for Rajapaksa. Then Sirisena, under intense pressure, said he would reassemble Parliament on November 14, allowing it to vote on its rightful prime minister. But he reneged on the promise and did a complete about-face, dissolving the body and calling for snap elections in January. Sri Lanka’s highest court stepped in Tuesday, halting the president’s order and putting a stop to snap elections. It allowed Parliament to reconvene on Wednesday, where members held a no-confidence vote on Rajapaksa, rejecting his appointment as replacement prime minister. Far from resolving the political spat, the vote has plunged the country deeper into crisis. Rajapaksa and his supporters deemed the initial vote as illegitimate. They have since used violence — and chili paste — to prevent a second no-confidence vote on Friday. That gambit failed, and members of Parliament again rejected Rajapaksa in a second vote on Friday. Rajapaksa, however, has refused to budge, and the president has backed him up. Parliament will likely be back in session on Monday. But there’s no sign that the weeks-long standoff will be resolved soon. Sri Lanka remains on the precipice of a full-blown political catastrophe, with fears of violence returning in a country that’s still healing from a decades-long civil war. Former Sri Lankan president Mahinda Rajapaksa. Buddhika Weerasinghe/Getty Images. Rajapaksa served as a popular Sri Lankan president from 2005 to 2015. He is credited with finally resolving the country’s more than 25-year civil war with a separatist group known as the Liberation Tigers of Tamil Eelam, or the “Tamil Tigers” for short. 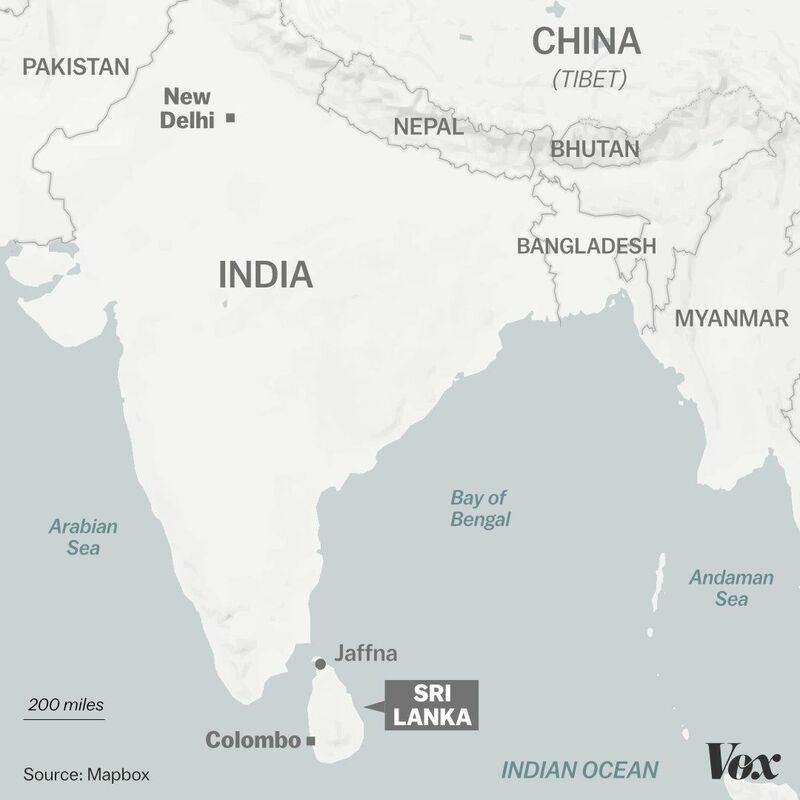 The bloody ethnic conflict had been waging since the 1980s, with the largely Hindu minority Tamils seeking independence from the Buddhist Sinhalese majority. But the tenuous peace Rajapaksa helped secure in 2009 came at a heavy cost. Rajapaksa has been accused of allowing war crimes and other human rights abuses under his watch, particularly during the final, brutal push to end the insurgency — including attacks on civilians and denial of humanitarian aid. Once Rajapaksa secured victory, he resisted international efforts, including by the United Nations, to investigate atrocities. Rajapaksa has also been tied to the abduction and death of journalists during his tenure. Sirisena, a former minister in Rajapaksa’s cabinet, capitalized on this ahead of presidential elections in 2015, breaking with his former ally and joining the opposition against him. Sirisena won in 2015, and his upset victory was seen as a promising sign for Sri Lankan democracy. Sirisena promised to crack down on corruption and implement government reforms. He also took a less hostile approach to the United Nations and accepted a resolution to investigate war crimes, part of a broader push for reconciliation in the post-civil war era. Geopolitics also factored into their political rivalry. Rajapaksa sought closer economic and political relations with China, and when he was president he took loans from the Chinese for pet projects a maritime port and airport in the remote Hambantota area; the airport was dubbed “the world’s emptiest.” Sri Lanka now has serious debts to the Chinese. The opposition, including Wickremesinghe, criticized these deals at the time, and sought to move closer to India. Sirisena’s government, with Wickremesinghe as prime minister, hasn’t fulfilled its agenda since it took power in 2015, and the two politicians have repeatedly clashed. Sirisena has been criticized for slow-moving economic and government reforms and stalling on promises of reconciliation. Sirisena’s deteriorating partnership with Wickremesinghe exacerbated this sense of political impasse. So Sirisena had a strong motive to replace Wickremesinghe, despite the truly astonishing political risks. But he seems destined to be the loser, no matter the outcome: either his gambit will fail, or, if Rajapaksa does manage to take control of the prime ministership, Sirisena will have empowered a former rival, who is more broadly popular and likely won’t defer to the president. An alleged assassination plot, an ousting, and politico limbo in Sri Lanka. The rumblings that prompted Wickremesinghe’s ouster actually started earlier in October, when a report in the Indian newspaper the Hindu said that Sirisena had been accusing Indian intelligence of trying to murder him. The Indian government denied the report and assured Sirisena that it did not want to kill him. But apparently Sirisena did not let this idea go, and now he says one of Wickremesinghe’s cabinet ministers plotted to kill him, and has claimed Wickremesinghe failed to properly investigate. Rajapaksa was sworn in as prime minister on October 26, though, and he claimed he had the support in Parliament to back him up if it were put to a vote. Sirisena originally said he would not reconvene Parliament until November, which many saw as an attempt to wrest the votes for Rajapaksa. Sirisena had finally agreed to reconvene the Parliament on November 14 — this Wednesday. But over the weekend, the president reversed course entirely and dissolved the entire Parliament and called for a snap general election next year, on January 5, with the body to reassemble on January 17. Sirisena justified his decision as an attempt to avoid political violence. “It appeared to me that, if I allowed the Parliament to be convened on the 14th, without dissolving it, it could have brought about commotion and fights in every city and every village would lead to very unpleasant and difficult situation for the average citizens of my beloved country,” Sirisena said about his decision. “As such, the best solution was not to allow those 225 members in the Parliament to fight each other and allow that to develop into a street fights in every part of the country,” he continued, saying it was “his duty and responsibility” to let voters decide the Parliament through a free and fair election. Wickremesinghe’s supporters challenged Sirisena’s decision, framing it as a ploy to avoid a decision in Parliament, where Rajapaksa wouldn’t have the votes. But Wickremesinghe’s party also took it a step farther: to the courts. On Tuesday, Sri Lanka’s Supreme Court agreed, ordering a pause to Sirisena’s snap elections. But the order was temporary, and the Court will hear more arguments next month, leaving open the possibility that the Court could reverse its decision and keeping Sri Lanka’s political future in doubt. The Court’s decision, which aligned with the current Parliament, represented a “significant institutional setback” for Sirisena, Feltman said. But it’s one that the president, his chosen prime minister, Rajapaksa, and their allies are apparently trying to overcome. Rajapaksa refused to accept the result. 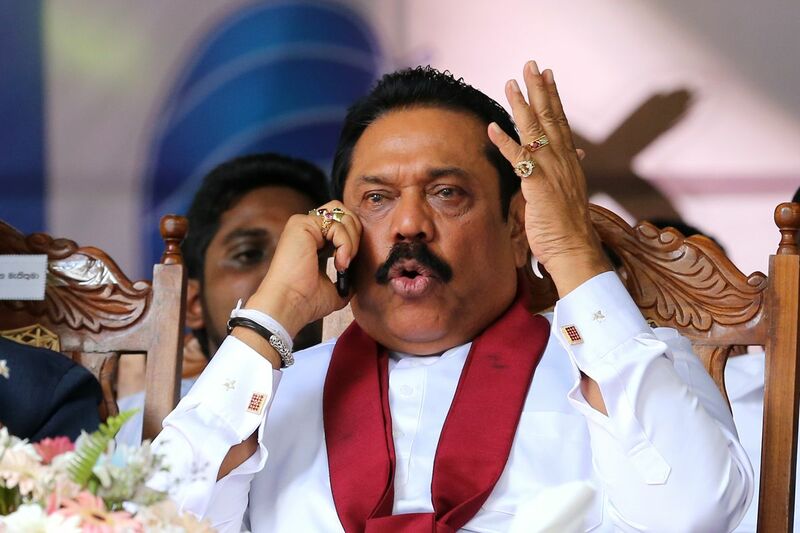 He argued that the way it was carried out — with a voice vote, rather than by roll call — made it illegitimate, though he failed to mention that outbursts in Parliament, including from Rajapaksa’s own supporters, prevented an orderly vote. It got worse from there. Brawls erupted in Parliament on Thursday, with reports of fistfights among lawmakers. Some of Rajapaksa’s supporters allegedly threw garbage bins at the opposition, and on the other side, a United National Party MP reportedly wielded a knife. President Sirisena said he would not accept Wednesday’s no-confidence vote, using the (somewhat ironic) justification that it violated constitutional and parliamentary procedures. But the president softened somewhat after Thursday’s violence in the legislature, and he hosted discussions with leaders and instructed them to call a do-over with full debate and a roll-call vote. That potential resolution proved useless on Friday after violence broke out again. As Rajapaksa watched from his chair, his MPs attacked the officers with chairs and books, injuring up to 11 of them. Other legislators tipped the Speaker’s ceremonial chair to the floor and dragged it across the ground.Taking refuge on a side bench and surrounded by police, Jayasuriya called for a voice vote on the no-confidence motion in Rajapaksa. A roar erupted across the chamber and the Speaker declared the vote carried by a majority. Rajapaksa rejected the outcome of the second vote, and the president did as well, according to his spokesperson. On Friday, Sirisena tweeted that he wanted Parliament to uphold democracy and parliamentary traditions. It’s a somewhat odd sentiment coming from the person who instigated this intensifying political crisis. Violence in Parliament has derailed the body from being able to choose its rightful prime minister. Each side is blaming the other for the chaos, though opponents of Rajapaksa are accusing his supporters of fomenting the unrest because he still doesn’t have majority support. The conflict in Parliament underscores larger tensions that have ratcheted up in the country since Sirisena swapped prime ministers on October 26. The week after his move, thousands of protesters flocked to Sri Lanka’s capital, Colombo, to demand that Sirisena call Parliament back into session and end this self-inflicted constitutional crisis. The rallies have largely been peaceful, but violent clashes have broken out — most notably on October 28, when one of the deposed ministers tried to reenter a government building and encountered supporters rallying for Rajapaksa. The pro-Rajapaksa crowd tried to block the minister from entering the building, and a bodyguard fired into the crowd, killing one person. But the continued risk for violence is particularly acute in Sri Lanka, whose history is punctuated with ethnic conflict. Rajapaksa was president during the end of the country’s civil war, and experts worry that if Rajapaksa prevails in the power struggle, it could heighten ethnic tensions against Tamils and other minorities, as he’s been known to stoke Buddhist nationalism. Meanwhile, China seems just fine with finding an old ally suddenly back in power; Beijing was quick to congratulate Rajapaksa. It’s a sign that the region’s rivals, India and China, are closely watching the developments in Sri Lanka for their own geopolitical gain.